[Editor’s note: Part 1, “Why Vouchers Exist, and Whether They Should” describes the events leading up to the creation of school vouchers in Ohio, along with reasons which countered objections to their implementation. 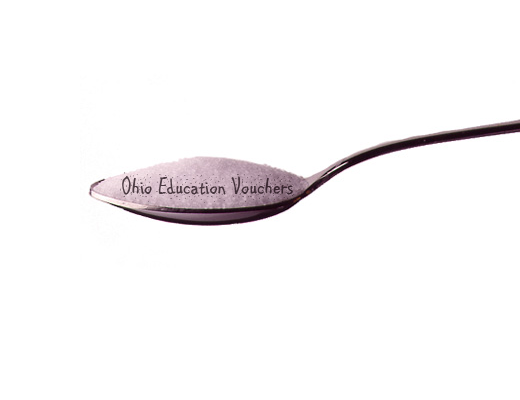 Even with its recent expansion, Ohio’s voucher program should be viewed as just a beginning. The current cap covers just over 3% of our state’s children between the ages 5 through 17.1 True, state programs such as this are not intended to cover all students. Perhaps they should be modified to do so. However, their objection can lead to a conclusion which they certainly did not intend! Try this analogy. When one is sick and the physician prescribes something to combat the illness, it is imperative that all of the medication be taken within the proper time frame. If not, the microbes causing the illness can become immune to the drugs and return more virulent than ever. Our public school system, in general, it is not well.3 Taking just part of state funds to more effective private schools is similar to taking just some of the medication. While it helps the recipient students for a while, the resulting fiscal pressure left behind may worsen conditions for those remaining in the public system. To cure the system of its ills, all of the medicine must be taken. It may not be pleasant, but neither is the current crisis. A living example of “taking all of the medication” can be found in a recent A Wall Street Journal article.4 It reported that New Orleans’ failing public school system was taken over by state authorities after the disastrous Hurricane Katrina in 2005. Since then graduation rates have gone from 52% to 78%. This particular statistic is important because it surpasses those of other cities (such as Detroit, Baltimore, Washington D.C., and Oakland) that are also trying to boost achievement among lower-income students. In addition, the percentage of New Orleans students proficient in math, reading, science, and social studies improved to 58% after being under 40% as recently as 2007. After Katrina, the state board took control of all but the thirteen best schools, which remained under the local board. The state converted most of the schools to charter schools and staffed them with non-union teachers. The teacher training program, Teach for America, currently provides one-fourth of the teachers. While teacher salaries are not yet to the current state’s average of $49,246, they are 20% higher than before the storm.5 School funding in the city is now at $13,000 per pupil vs. the state’s average of $11,000. Before Katrina, New Orleans was at $8,000.6 So there is a cost involved … and a matter of priorities. The New Orleans system began grading schools on an A to F scale for academic performance. Schools which continue to underperform are either closed or assigned new operators. Parents can make a maximum of eight choices for each child among 78 charter schools, eight traditional campuses, 38 private schools and one independent school. Currently, 84% of its 42,000 public school students attend charter schools, which is the highest share in the U.S. The system is certainly not on cruise control yet. The application process still needs improvement. For example, parents don’t always know at the time of their selections how many seats are available in a given grade at a particular school. In addition, it will take a few years to bring all eight schools currently graded as “A” into the more equitable the lottery process. Nevertheless, in addition to the academic improvements, the system has had a side benefit of encouraging parents to become more involved in their children’s futures – a key to progress. Future Control of Public Schools: State or Federal? The results from New Orleans’s experiment and the states with vouchers show that progress is being made on the local level. Perhaps the New Orleans experience can help school administrators in Ohio, and the nation, to bring competitive excellence to the education process without the looming specter of federal control via Common Core and other initiatives. How Do Other State Programs Differ from Ohio’s? The following information is taken from the previously mentioned NCSL. Arizona: also includes children of active duty service members and those in foster care. Private schools are not required to give assessments to recipients, and the voucher’s maximum dollar value is 90% of what the district would have received for each student. Florida: only for students with disabilities or those with Individual Education Plans (IEP). Parents are to receive a written assessment of the student each year and parental requests for state exams must not be granted. Dollar amount is equal to what public schools receive for each student. Georgia: program requirements are essentially the same as Florida’s. Maximum dollar value of vouchers excludes federal funding amounts. Indiana: for students “with household incomes up to 150% of the free and reduced price lunch guideline.” Schools must implement annual teacher performance evaluation plans. Louisiana: eligibility covers those with household incomes up to 250% of federal poverty guidelines and if attending a school whose state grade is C or lower. All kindergarten students meeting the income requirement are eligible. Academic accountability systems must be approved by the state for participating schools. Income based vouchers match state per pupil allocation, 50% for special needs. Maine: Eligibility concept is the same as its 1873 inception — only for those in a district that does not have public schools or does not contract with another district. Mississippi: only for students with dyslexia in grades 1-6, max. dollar value equal to state allocations and other applicable funding, student’s progress does not include assessment exams. Oklahoma: for those with disabilities who have an IEP. No assessment test is required and the State Board must use a funding formula annually to set voucher values. Utah: similar to Oklahoma’s except vouchers can be between 150-250% of state allocation per pupil. Wisconsin: for all students with household incomes up to 300% of federal poverty guidelines. Schools may not reject students except for lack of space and must provide minimum hours of direct instruction. No additional tuition is to be charged if household is under 220% of poverty. Vouchers are at the level set in 2010-11 plus applicable annual increases but no decreases. Washington D.C.: eligible initially at 185% max. of poverty guideline and students can stay in the program until income surpasses 300%, voucher max. at $8,136 for K-8 and $12,205 for 9-12 with inflation increases. Iowa allows tax credits of 65% for amounts donated to a “school tuition organization” which awards “tuition grants” to students whose families’ incomes do not exceed 300% of the federal poverty guideline. Iowa has a statewide cap of $7.5 million for this program. New Hampshire and Rhode Island have similar tax credit and scholarship award programs. Only Ohio, Indiana, and Racine, WI have caps on number of annual vouchers for those eligible. However, not all children are eligible in the other states either. Therefore, Ohio’s limit of 60,000 in its EdChoice program is not necessarily more restrictive. 5 – Average teacher’s salary in Ohio for the 2010-11 school year was 16th in the U.S. at $56,715 or 2.2% above the national average. Louisiana was 27th at an estimated $50,179. Data is from the NEA web site. 6 – For comparison, estimated student expenditures for the 2011-12 school year, Louisiana was 28th with an average of $9,998 spent per student, while Ohio was 30th at $9,842. The national average was $10,834. Data is from the NEA web site.